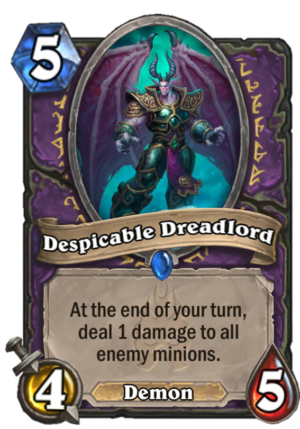 Despicable Dreadlord is a 5 Mana Cost Rare Warlock Minion Demon card from the Knights of the Frozen Throne set! At the end of your turn, deal 1 damage to all enemy minions. Rating: 4.7/5. From 1390 votes. Can we call him Gru? No, because we aren’t children. I’m not sure if I’m digging this card. Clearly in the minority here, but I’ll throw it out there. In most situations, this is going to be a 5 mana 4/5, “Battlecry: Deal 1 damage to all enemy minions at the end of your turn.” Not that Yeti is bad stats, but it’s not great on a 5 drop. The “end of turn” requirement kills it for me, because this would be great to combo with something like Defile, as you’ll have wounded minions you could finish off with that combo. However, since it happens after you hit “End Turn”, you can’t do that. I don’t know, not good enough for control. Why not play the 6 mana 6/6 that does the same thing? 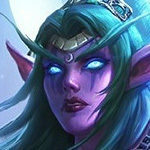 You don’t lose stats for the same effect, and every Warlock has it for free. …If it even sees play this expansion. Correction: The 6 mana 6/6 does (almost) the same thing: Just hits your own minions which isn’t always a drawback. Dread Infernal 6.6/6 is Not the same thing. It reads: “Deal 1 damage to ALL other characters”, including both heroes. Maybe Demonwrath is a good combo to play with for complete the AoE. This card is wreaking havoc on my Baku Paladin Deck so I wouldn’t toss it on the trash heap just yet. 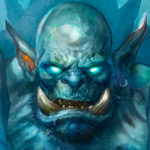 Yeti for 4 mana and arcane explosion for 2… equals five mana. Sweet. This is SLIGHTLY worse than traditional Arcane explosion because sometimes you want Arcane explosion to go off immediately, not at the end of your turn. But since it has the potential to do it multiple times… man, this card looks sweet. Warlock is going to love this card. That is, if they see any play. The killjoy in me DOES have to bring that up. 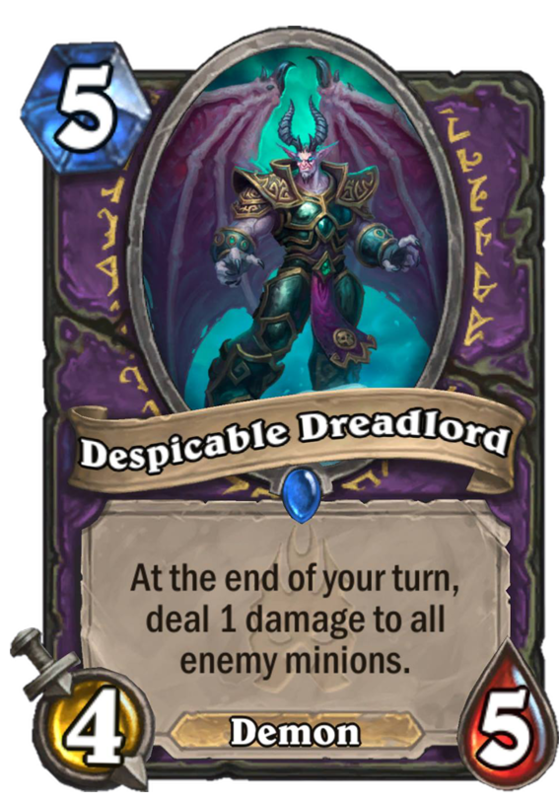 The situation where this card isn’t good is that Warlock continues to see no play, which by extension means this card will see no play. 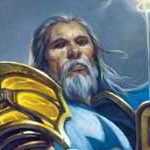 But I’d like to see Warlock make a comeback, so I’m rooting for this guy. I feel its overrated. Its still just a 4/5 body for 5. Sure the power is ok if you oponent still has 1 h minions on turn 5. But if he got better health minions, they kill this and if not he plays high health minion that does not care about 1 damage. Also cant scale the power with spell damage. Just a 4/5 for 5 with 1 pulse is still on par with maelstrom portal. Plus persistent value cards like this always force a response from the opponent and forcing your opponent to do stuff means they don’t always have the cleanest answer and get sidetracked from their game plan. Baron Geddon is 7/5 for 7 mana, a very poorly statted minion, but seen a lot of play a while ago. This minion probably dies harder on turn 5-6 with same health and you can have too of them. And it doesn’t damages your own board. My only concern is that the difference between 1 and 2 could be more than obe would think. There’s a key difference between Geddon and this card: Geddon also hits both faces and your own minions. The fact it hits faces makes Geddon a tool to pressure lethal as opposed to being strictly board control. For 2 less mana, you get a more safe way to encourage board control, but I’m not sure if it’s good enough for the 4 drop stats. Amazing. It’s almost better at 5, giving them another turn to extend into it. 4/5 is a good size, regardless of cost. I really like this minion. Such a great card vs aggro, f*cks up token evolve shaman. Obviously not as good vs mid/control so i guess it depends on the meta. Exactly which would be More appropriate. It’s essentially better than baron geddon and dreadscale and is a freaking rare by comparison.